Decisions are being made at McFarland Gap to the northwest that will affect careers. General Davis takes approximately 1,500 men with him back toward Thomas along the Dry Valley Road. General Sheridan states that he will take his division to Rossville, and from there move down the Lafayette Road toward Kelly Field. 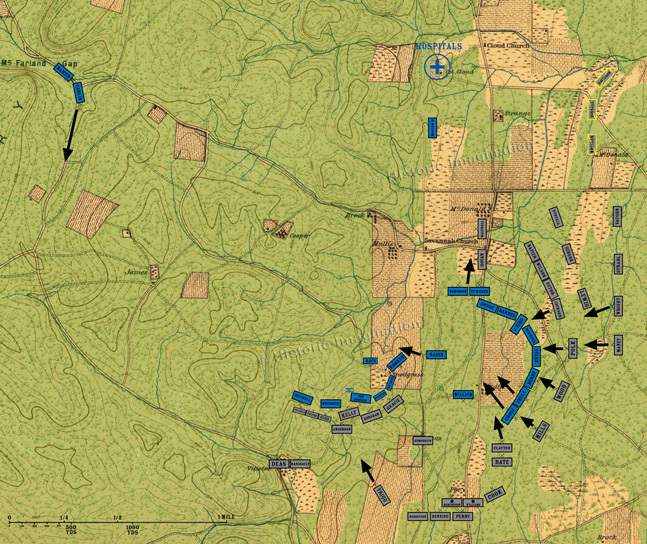 Generals Negley and Van Cleve decline to advance to help the rest of the army. Neither hold active field commands after the battle. The fighting continues on Snodgrass Hill and Horseshoe Ridge. To the east, the Confederate Right Wing begins its final assault on the Federals at Kelly Field as the Union troops attempt to withdraw at the same time.